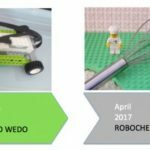 Dr. E’s WeDo Challenges and Dr. E’s MINDSTORMS Challenges have launched new cycles of challenges, one each month from February through May. Created by Professor Ethan Danahy of Tufts University, these sites encourage students from around the world to find creative solutions to open-ended problems using LEGO robotics and then share their creations with one another. Both sets of challenges are open to LEGO BOOST users. 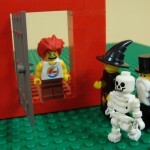 The February MINDSTORMS Challenge is Clean Sweep: As all LEGO fans know, pieces of plastic tend to end up on the floor! Create a MINDSTORMS sweeper to clear the floor of LEGO bricks or other small LEGO pieces. Any type of device is fine — broom, plow, vacuum — as long as it gets the floor clean. The February WeDo Challenge is WeDo Weather: Sun, rain, fog, snow—everyone has to cope with the weather. Invent a WeDo device to help: a sensor-controlled fan, a motorized umbrella, a snow shovel you can drive, or anything else you can imagine.